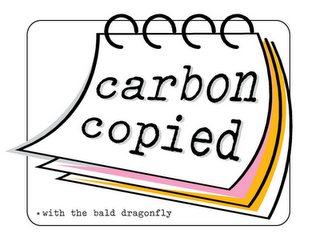 I'm so excited today to be playing Carbon Copied with Karen Baker of The Bald Dragonfly! It's a new feature that Karen has started where she and another Blogger use the same stamp set, the same challenge and post their results on the same day at the same time. Karen was one of my earliest blog friends and has continued to be so generous and supportive with her comments and ideas. And let's not forget that her cards are stunning! I found her thanks to Lynn Mangan of The Mango Boys and Me who just so happens to to have taken part in the inaugural Carbon Copied challenge with Karen last week. Love all these bloggy connections! So Karen and I decided to take part in this week's colour challenge at Inkspirations and to use the Hello Noteblock stamp from Purple Onion Designs. And here's my card. Embossing, fussy cutting, pop dots and a few flowers. Ahh! Now hop over to Karen's blog and check out her creation! Yay, great to see you playing along with Karen! What a fun idea and I thoroughly enjoyed browsing her blog! I love how you popped out one word and your use of the colors is perfect! Ooh, fantastic creation! The fussy cutting is amazing on your card! Great addition of the flowers too. Thank you so very much for playing along with me today! LOVE the bold graphic look of this card, Jen!!! And the way you cut out and popped up CIAO in blue is AWESOME!!! Great job!!! Yeah for the carbon copied card! LOVE it, Jen! The bold blue is seriously awesomely fabulous. And I think I'm going to have to find that stamp--love it! Looks like your mojo is back! Happy, happy, happy...I love your card Jen...and so fun to be playing along with Karen! 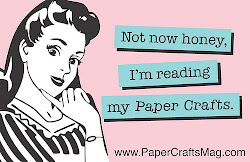 Your fussy cutting is fabulous! What a fun challenge. You girls rocked it! Oh my this is so super fun! I love how different your cards are! I love how you popped up CIAO and used the blue! FANTASTIC! Oh, how fabulous is this? I love that you are doing this challenge!! Great card. I love those little flowers and the awesome colour combo. That block stamp is awesome!